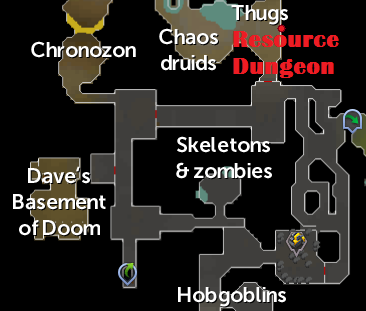 The Chaos Druid Resource Dungeon is a resource dungeon accessible from a portal located in the western area of the Edgeville Wilderness Dungeon. It's entrance is in the wilderness, but it itself is not. Enter the Edgeville Dungeon in the ruins south of the the Edgeville bank. Walk north until you enter the Wilderness portion of the dungeon. 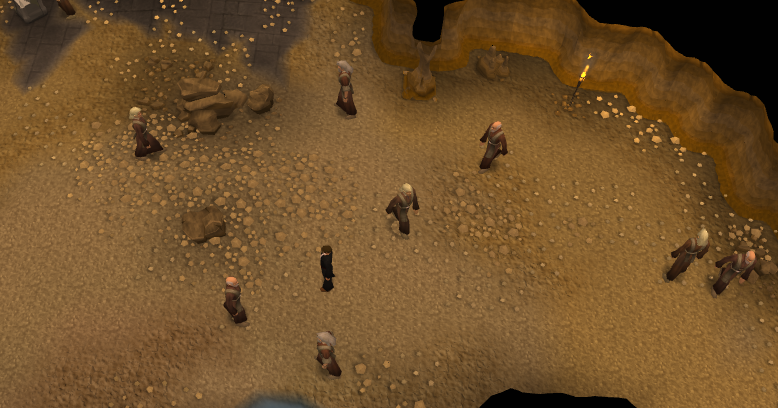 The resource dungeon entrance is on the east side of the dungeon in level three Wilderness. Not that while the entrance is in the Wilderness, the resource dungeon itself is not in the Wilderness. You will get 1100 dungeoneering experience for going here the first time. There are twelve chaos druids here and four herb spawns. Killing chaos druids has always been a good way for lower-leveled players to obtain herbs. Here, you can kill them outside of the Wilderness and with four herb spawns around the dungeon.